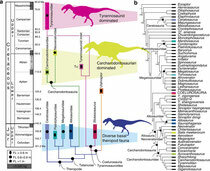 白亜紀後期北米からネオヴェナトル科の頂点捕食者 - dinopantheons jimdo page! Preserved elements of the axial and appendicular skeleton shown in white; missing portions outlined in grey. Scale bar, 1 m.